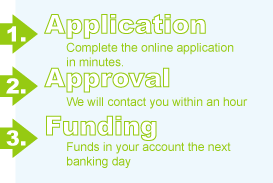 Our loan application is easy and secure. You can apply online or by phone in just a few minutes. Either way, you'll get an answer in seconds. Why not apply now and find out how much cash you can get? All you need to apply for a loan from CheckAdvanceUSA.Net is an email address, active checking account, and a job or regular source of income. You must also be at least 20 years old and a US citizen. Upon approval, your checking account will be electronically credited the next business day (for all applications completed by 5:00 PM MT). With our member area, you'll have online access to your account 24/7. You can check your balance and make payments with just a few clicks. We'll even send you email reminders when a payment is due. And if you ever need help, just call or email and a representative will be happy to assist you.